The handover of souvenirs are by representatives of Expedition NKRI to Kasrem 174 / ATW, Wadanlantamal XI / Merauke and representatives of Merauke Government. A total of three hundreds more expedition participants of the Unitary State of the Republic of Indonesia (NKRI) corridor of South Papua on Sunday (11/5/17) departed from Port Yosudarso Merauke to Tanjuk Periok Port Jakarta using KRI Surabaya 591. Kasrem 174 / ATW, Colonel Kav Ketut Adi Suasta Putra, SE, MM, said that representing the ranks of the National Police and Regional Government in the region of South Papua expressed gratitude for the implementation of NKRI Expeditionary activities, so it can run safely and smoothly in accordance with the planned. He hopes that this expedition activity can be beneficial for the four districts in South Papua. "Good luck, hopefully return safely to their respective areas," said Kasrem during the release of the expedition NKRI Corridor South Papua. At the same time, they were also present in the release of NKRI expedition of South Papua corridor Wadanlantamal XI / Merauke, Colonel Laut (P) Jatmiko along with assistants of Danlantamal XI / Merauke, Kasrem 174 / ATW and Kasi and Kabalak from Korem 174 / ATW. 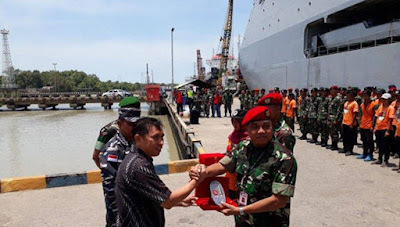 Head of Merauke District Health Office, dr. Adolf Janu Bolang, Head of Mopah Merauke Airport, Budi Jatmiko, Commander of KRI Surabaya, Sea Lieutenant Colonel (P) Heru Samsul Hidayat and Merauke Police Chief AKBP Bahara Marpaung, SH.